Lead generation is a simple process once you understand your marketplace and how your product adds value or solves a problem for your customers. Your company’s web site, for example, can be a tremendous vehicle to generating leads quickly. Anyone can create a form to post on the web site to collect all the information you could want from your prospects: names, titles, phone numbers, budgets, buying habits, and customer needs. In fact, if you place a direct self-gratifying “reward” to the prospect for providing the information (like $100 for everyone who fills out the form), you will get more names that you will know what to do with. 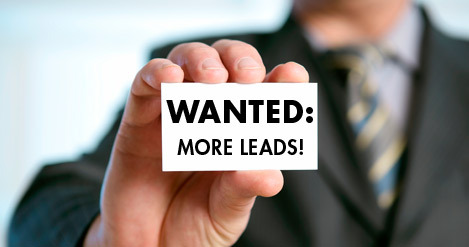 If $100 seems like too much, analyze what a new lead is currently costing you to capture! Organizations must find unique approaches to managing the customer enterprise and utilize the Internet to share and manage leads and corporate information with their marketplace. Lead qualification is critical to managing resources and meeting business objectives. Too many organizations do too little qualifying of leads and consequently pollute the sales funnel. Understand the 8-4-2-1 rule: 8 qualified leads turn into 4 sales presentations, which turn into 2 sales quotes that result in 1 sale. Take the time to evaluate your last quarter’s leads-to-sold reports to determine exactly where sales are getting lost. Are you receiving too many qualified people or too little? Does everyone get a demo or presentation? Are 50% of your sales quotes closing? Most organizations call on every single prospect and spend an inordinate amount of time and money spinning their wheels. You need to understand that not everyone who contacts you is interested in your product and is certainly not ready to buy your product tomorrow. First, you need to have basic procedures on whom to call, to whom to send e-mails, and who to ask to go to your web site for more information. You need to ask clear questions up front and to listen to what your prospect needs. Most salespeople call on prospects with little or no qualification process via the phone. In other words, they automatically set up a face-to-face visit. They go to visit the prospect, open up their literature, and go into an automatic canned presentation. Afterwards, they ask the prospect what he or she thinks about the products and then ask if it’s okay to send a quote on the products in which he or she just expressed interest. Instead, make contact with a prospect after you have pre-qualified him or her on the fact that he or she has a need, has provided a time frame, and how much money he or she has allocated for it. Now go visit the prospect. Selling is all about relationships — the key word is trust. When you visit, introduce yourself and then ask about needs, not dwelling on what you offer. Now customize your solution to his or her needs. It’s only now that the prospect is listening. The greatest hunger of human nature is to be understood, so feed that need and you will build trust. Build trust and you will get the sale. So what happened? The answer is that you did not listen to your prospect’s needs and you did not get him or her involved as part of the process. You should have followed up after the meeting with a quick phone call telling the prospect that you were putting together a preliminary proposal and wanted him or her to review it before the final version was complete. The preliminary proposal should include key words that were discussed during the meeting, such as the timeline and specific quantities and dates. Have the prospect review it and make comments. Integrate those comments into the final proposal. Overnight the final proposal and set up a meeting to verbally review the proposal together. Then close the sale at the end of reviewing the proposal.